Owl City macht zuckersüssen Pop, Carly sowieso. Dass diese Combo funktionieren würde, war sowieso zu erwarten. "Good Time" ist ein sehr schöner Pop-Song und wird wohl beide Künstler von ihrem One-Hit-Wonder-Stempel erlösen. edit: Werde später evtl. noch erhöhen... Sommer-Song 2012! Bereits Top10 bei iTunes in diversen Ländern (zB UK!). edit2: Jetzt rauf auf die Höchstnote! Mein Sommer-Song! Good enough, has the potential to become a big hit. EDIT: Overplay of this song is killing it for me. 4* -> 2.75*. Even though I've always despised Owl City from making it big out of a watered down rip off of a beloved indie favourite, I've never had that much of a problem with most of his music. If not for the irritating vocals, I could easily listen to an album in the background. Even "Fireflies"(!) despite its flaws, at least was somewhat refreshing as a chart hit. This does not have that benefit. Musically Owl City manages to one-up himself, and create a watered down, boring version of his own music! And then the song is basically a rush through verses as quickly as possible to allow time for more 'whoa-oh-oh-ohs, and frequent assertions that it is indeed, always a good time. I haven't even heard this song that many times and I'm already sick of it. I suppose it's not the worst thing around but it irritates the heck out of me. I will give it the positive note that it does show that people can be too quick to the one hit wonder label, and it's quite interesting that it is a hit. Ik vind hem verassend goed en zeer sterk! Misschien zit er nog wel eens een nr 1 hit in voor owl city ! Zou leuk zijn. Tijd voor de nieuwe van Owl City - Shooting Star !!!!!!!!!!!!!!!!!!!! Catchy but not overly great. Edit: Oh, I got so sick of this and came to find it quite childish. It has hit written all over it - but I much prefer Call Me Maybe. EDIT: Liked it then hated it then liked it again. Bless Adam Young he looks so awkward in this video clip. Good dance song but nothing more. Also the awful autotune fail at 'we don't' of 'we don't even have to try' is very very bad and such a poo. Erzeugt gute Laune, dieser Track. Die Melodie ist easy u. der Sound sphärisch-fein. A little generic here and there, but I can't help but really enjoy this track. Really fun and infectious, all-round great pop song. Favourite part of this collaboration is that it's saved both Owl City and Carly Rae Jepsen from reaching one hit wonder status. Ein Song nach dem Motto: "Alle sind happy, alle sind glücklich, egal woher jeder kommt, alle sind einfach nur happy together, super Zeit, super Leben, alles ist schön" -> oder kurz: alle haben mächtig an einem Joint gezogen! Fazit: Ein netter Song, der gar nicht so schlecht daherkommt! Für einen #1 Hit schon sehr belanglos. Was ist daran so sommerlich? Ist wohl auch schon länger her, dass man was von Owl City gehört hat! Ich gebe zu, ich mag den Sound von Owl City. Deshalb eine 5, weils wieder sofort ins Ohr ging. Fröhlicher gute-laune-song, wie man es von den beiden gewohnt ist. Einfach, simple, aber effektiv und eingängig. Nach zwei Jahren wieder gehört - und einen Stern abgestuft. #11 der deutschen Singlecharts am 6. Oktober 2012. Toffe hit/samenwerking van Owl City en Carly Rae Jepsen. Ook terug te vinden op het Owl City-album "The Midsummer Station" (2012). Werd trouwens een top 10-hit voor hen in de Vlaamse Ultratop 50 (herfst 2012). 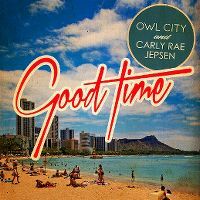 Der Hit-Song «Good Time» von Carly Rae Jepsen und Owl City ist momentan alles andere als «eine schöne Zeit». Ein Gericht in Los Angeles hat eine Plagiatsklage gutgeheissen. «Good Time» ist demnach nicht mehr als ein Abklatsch vom weniger bekannten Lied «Ah, it's a Love Song». Sängerin Ally Burnett reichte die Klage ein - und kriegt jetzt umgerechnet gut 722'000 Franken Tantiemen zugesprochen. Guter Radio und Party Song.